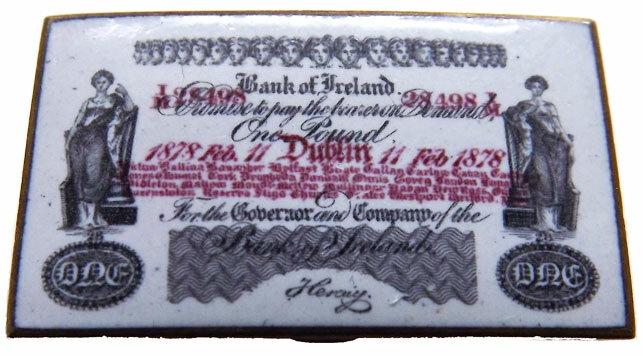 Enamel pin badge featuring a Bank of Ireland banknote, dated 11 Feb 1878. There are several varieties of these badges. A Bank of Ireland £1 One Pound note from the same era as the badge. The badge design is based on this banknote design. 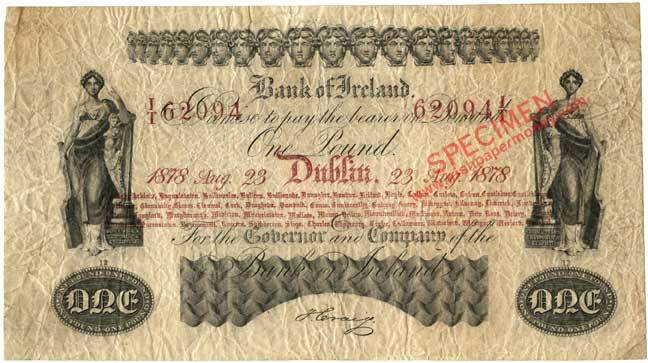 Bank of Ireland £1 One Pound 23 aug 1878. All of the bank's branches are listed on the bankotes. There are 58 branches on the bankote, the badge manages to squeeze 33 in, which isn't bad considering the small size of the badge. However, there is an error on the badge, in that in the branch list 'LONDON' appears in place of 'LONDONDERRY'—Bank of Ireland didn't have a branch in London, whilst it did have one in Londonderry in Co. Derry in Ireland. An interesting anomaly, and not the only error that has appeared on one of these badges.